For Correspondence: PLEASE REFER TO ITEM# NUMBERS ! 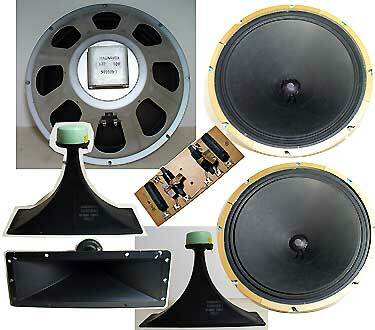 These USA manufactured Jensen speakers come from the golden age of vaccum tubes when output power was scarce. Most of these are high efficient speakers, which means that little power is needed to bring out considerable volume and quite a bit of detail. The desirable of vintage guitar speakers is also non linearites in fruequency response and resonance frequencies as favoured by many guitar players. So: To be used with vintage amplifiers in the 10 to 30 W range. The below listed power capacity is an estimate based on hooking them up. . To use these speakers with higher powered amplifiers, such as solid state amplifiers (if not several speakers are used to distribute power among them), is likely to destroy them. All speakers were tested and swept with a sinus wave tone generator to detect potential problems, but do to age, are sold "AS IS"
ONE OF A KIND ITEMS - Only one availalbe each and once sold gone! 2. 12" 1961 Jensen P12N Speaker. 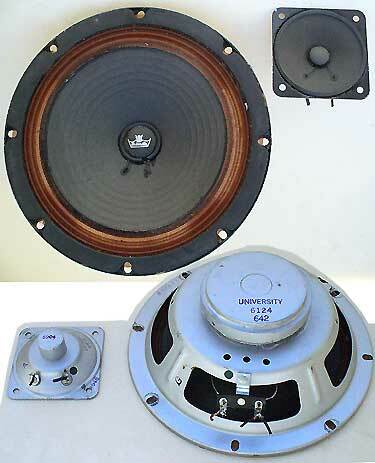 This is the higher powered version of the Alnico magnet speakers rated at 50W (heavy magnet). Date of manufacture: 21 st week of 1961 by the US Chicago plant. Numbers printed on the basket of this speaker: P12C6641, 50948, printed on the top of the magnet: 220121 (= date + manufacturer code); Model: P10N C6907 2, D613 024675 C, printed on the rim of the basket: Magnet: Alnico (large! ),, The speaker appears all original but has these defects: 3 Tears and waves in the moving edge of the cone, which I treated with a heavy duty elastic glue, which streghtened it as well. The dust cover was eaten by mice form the cewnter and is open. The cone of this speaker otherwise is in very good condition. The paint on the basket is perfect but peals off at one spot at the rim (visible in the photo). Overpayment refund when actual shipping cost calculated). Payment processed through PAYPAL. With Payment I will: pack, then calculate actual shipping cost to your ZIP code (within continental USA only! ), refund the shipping cost over payment (if any), SHIP and e-mail tracking number. Restrictions apply - so: I may cancel this purchase and refund. If need to approve shipping costs, before I ship, please use: Buy/Inquire instead. Please READ and agree to All details before proceding here.  INQUIRE! if you need only one additional informnation before purchasing theis speaker.  INQUIRE! if you need only one additional informnation before purchasing these speakers. Description: University Sound was later named "Altec": and at the time manufactured highest quality Hi-Fi speakers. The woofer and tweeter shown here are US made in the 50's and are: a vintage 8" woofer with folded Accordian Surround and a 3" paper cone tweeter. These speakers are perfect as a replacement if repairing a University UR-4 speaker, but the woofer possibly could make a nice guitar speaker as well. Condition: Excellent flawless condition and fully working. - Matched Pair + Jensen Horns + Frequency Network! Description: Offered here is the complete set of speakers form a 1960's Magnavox Hi-Fi Stereo Console. This set consists of 2 15" Alnico Woofers a pair of American made Jensen metal horntweeters, plus the matching frequency network. Needless to mention, that these speaker drivers came form a time when output power was scarce and thus best are powered by tube amplifers. At the time speakers prodced a large potential of volume without requiring much power , later called "High efficiency" speakers. Perfect for vintage Hi-Fi Consoles but also great in low powered Hi-Gi cabinets intneded to be drivenby tube amplifiers. These come from the golden age of Alnico magnets and the classic vintage paper cones.. 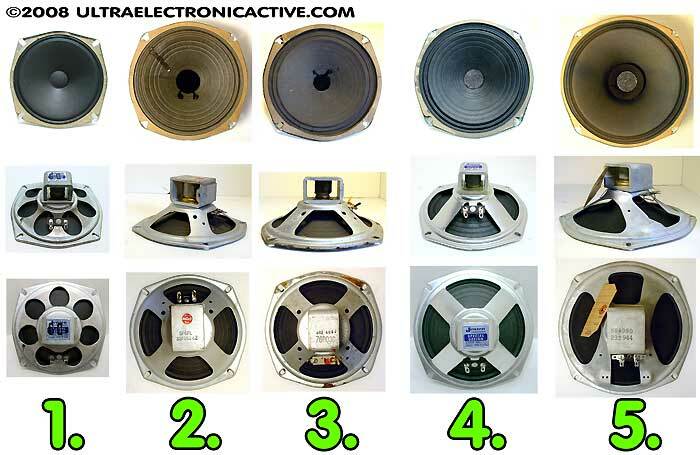 Most of these are high efficient speakers, which means that little power is needed to bring out considerable volume. The desirable of vintage speakers is their non linearites in fruequency response and resonance frequencies for the original vintage sound. All speakers were tested and swept with a sinus wave tone generator at appropriate power levels to detect potential problems, but do to age, are sold "AS IS"
Please note: SHIPPING CHARGES are as calculated by size and weight. Will ship in one packakge if several are ordered to save shiping costs. I will weight each package for before shipping and get the actual shipping charge. Inquire about shipping charges for the speaker(s) you are inteested in. ONE OF A KIND ITEMS - Only one availalbe each - When sold gone! Actual item shown in each picture. In quire for larger images, if needed. #1 5" 1959 Jensen P525-WA mid range / high range speaker. Date of manufacture: 11th week of 1959. Numbers stamp on the speaker magnet: (side): P525-WA C1 6640 114119 220911, on top of the magnet Silver / blus Jensen Special Design Label: "Jensen Loudspeaker - special Design - Jensen MFG CO Chicago - Made in USA"; There is a black rubber stamp printing on top of that label: "D 9:; Magnet: Alnico; Dust Cap: grey paper. The cone of this speaker appears original and excellent new like condition - what appears on the photos smudged due to image compression is the original cone seam, Basket shows soem aging. Paper gasket to mount the speaker has come loose.Works well. #2 6" 1953 Utah Speaker w/ red label sticker on Magnet: "Micro Gap UTAH", Model: SP6FL. Date of manufacture: 51 st week of 1953. 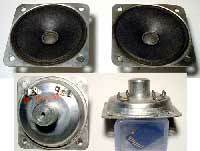 Numbers stamp on the speaker magnet: 328351 6Z, SP6FL; Magnet: Alnico; Dust Cap: black felt. The cone of this speaker had a tear which was repaired. Works well..
#3 6" 1954 Oxford Speaker, Model: 76P030. Date of manufacture: 24th week of 1954. Numbers stamp on the speaker magnet: 465 424J, 76P030; Magnet: Alnico; Dust Cap: black felt. 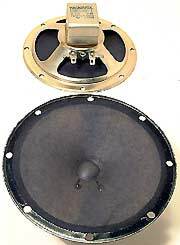 The cone of this speaker appears original and good, Basket has rust,, works well. cardboard gasket a bit wavery due to moisture and re-glued. #4 6" 1961 Jensen P6-VA Speaker. Date of manufacture: 37th week of 1961. Numbers stamp on the speaker magnet: (side): P6-VA C17258, 220137, on top of the magnet Silver / blus Jensen Special Design Label: "Jensen Loudspeaker - special Design - Jensen MFG CO Chicago - Mane in USA"; Magnet: Alnico; Dust Cap: grey felt. The cone of this speaker appears original and excellent new like condition - what appears on the photos to be greenish is actually blueish - looks like new!, Basket appears like new as well. works well. #5 8" Magnavox full range dual cone speaker. Original replacement for the famous 50's portable colaro record changer. I replaced both speakers on the unit this speaker came form unit, as I was unable to find an original replacement - so the good one is availalbe (works perfectly!). Date of manufacture: 44 th week of 1959 Numbers printed on the speaker magnet: 584 090, 232 944. 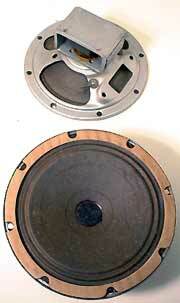 Magnet: Alnico, The speaker is all original. The cone appears in perfect near mint condition and has a felt covered dual cone center dust cover. There is a card board repair tag from a TV shop attached to the speaker (shown in picture). Vintage 4" Alnico Speakers Great Condition! - A perfect replacement! 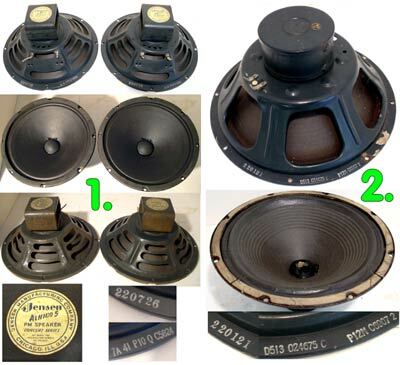 Description: These vintage Jensen Chicago Alnico 5" speakers were used in intercom systems, but can make a great mid range and mini guitar speaker. Theese speakers feature Alnico magnets, are 8 Ohms, and have paper cones with a felt dust cover - great for that truely vintage sound! The printed EIA code does not deceive me, these were made on the magnets says: "121715 (the other 121717) which means that these were made by Jensen in the 15th (and 17 th) week of 1957. The numbers printed on back of the one of the cones says: "P-640" which very well could be the model number. Condition: shows age, but all appears fine..
Dimensions / Measurements: outer diameter exactly 5", if measuring the cone edge to edge: 4 1/4". Lot: 1 vintage 5" Jensen speaker, each; I have 2 of these. Condition: Near Mint, veryy clean - look like new! - perfectly working. I have 6 of these. Dimensions / Measurements: exactly 4", if measuring edge to edge of the cardboard ring (mounting gasket) that is attached to the cone (see top image). Lot: 1 vintage 4" speaker, each; I have 6 of these. Description: These vintage Magnavox 5" Tweeters were likely made in the 60, feature an Alnico style magnet and are 3.2 Ohms and rated @ @Watts acrodign what is printed on them.The Magnavox part number as printed on the back of the magnet is: "Tweeter 69.24" where "69" possibly coudl mean 1969. 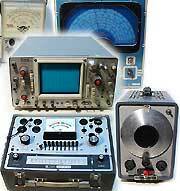 Each tweeter could be driven with a 3 uF 10 uF 50V capacitor as a frequency network. Description: A vintage tweeter from the early 60's - complete to simply be hooked up to any speaker to improve high frequrncy response - includes frequncy network cap as shown. Lot: 1 tweter as shown. Description: 3", 16 Ohms. This came out of a vintage 50's 2 way Hi-Fi Speaker system which was not labelled but possibly could be KLH - th ecabinets looked very much like it. Number printed on back: 10-03:57. The frequency net workt for these tweeters consited of a Sprague 5 uF 150 V capacitor switched in series. Condition: Really clean - look like new, work well.